Happy Hallowe'en, my friends. I thought the serendipity of this feature falling on this day called for some witchy cackles and a spooky poem or two. For that I didn't have to look far. I offer a witch's song of my own, as well as poems from Magaly Guerrero and our very own Passionate Crone, Rosemary Nissen-Wade. I hope they help you get in the mood for tonight's festivities, if that is your proclivity, and at least bring a smile, if it is not. Here is a short video to help set the proper tone. Pass me the stir-spoon, Sister, quick! This stew's getting a little thick. Push down the devil's claw. Mix in some thyme. The brew must be ready by dinner-time. and dont forget to spell the Cat. Owl sits in the corner with beady eye. Toss him a mouse as you go by. and call the witches-in-training in. and mind how you circle, or you'll tread on my boot. Toss in two warty toads and the leg of a frog. and I will teach a new spell to you. To draw love, catnip, valerian for sleep. Drop a marigold bloom in your tea; let it steep. Calamus root and the knuckle of a frog. We'll sing in the kitchen and dance with the dog. Snakes go hiss and flames they crackle. Potions bubble and pop to the witches' cackle. Bats are singing love songs as they swoop and zoom. They're chasing shrieking witches right out of the room. Come out, my pretties, to the meadow in the hollow. Skinny witches first, and the fat ones follow. and watch that black cloud cover the moon. This was written for a prompt at Real Toads some time ago, so I thought I might give it a little run around the ceiling on its broom, given it's Hallowe'en. I admit I had to google some herbs to find out what they were for. I need to brush up on my witcherly knowledge. I seem to have forgotten more than I ever knew. Cackle. loving you through the Veil. I wrote this piece last October, with my little brother in mind… I’ve written dozens of poems and stories inspired by him. I believe that as long as my words and I remember him, he will always live. Thanks so much for having me, my wild Sherry. I hope your All Hallows’ Eve (and your entire year!) is full of delicious poetry… and of magic that makes the heart dance aloud. 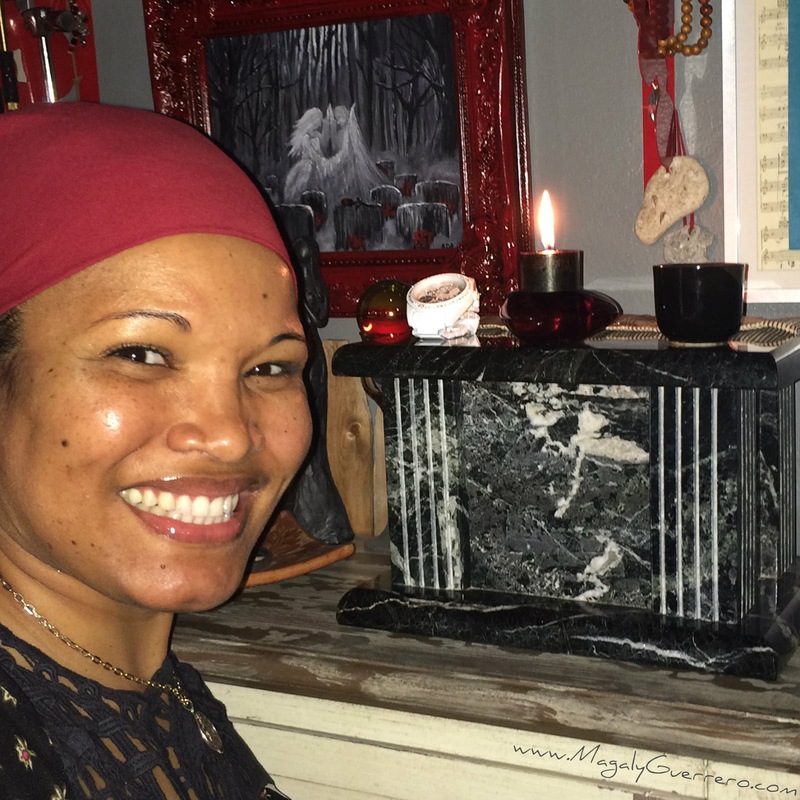 Sherry: Thank you, Magaly, my witchy friend, for your beautiful remembrance of your brother. Sigh. October is the time for remembering, for sure, those dearly loved departed souls. Let's see what wisdom Rosemary has for us on this witchy-est of nights. I so adore the photo of her in her witch hat, which she wears with aplomb. Rosemary tells me, "I celebrate Samhain, the precursor of Halloween – a time for honouring the ancestors, including any recent dead. Being a Winter festival, it happens on April 30th in the Southern Hemisphere. 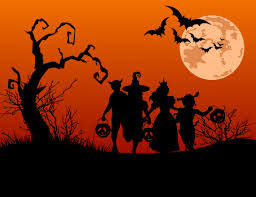 However, many non-witchy Australians nowadays copy the American Halloween, so October 31st has become a fun night in Australia, too, for the kiddies to dress up and knock on doors to ask for sweets." Rosemary has graciously allowed me to share the following poems, the first an enchanting exercise in trading pain for wisdom through ceremony, the second a witch dispensing treats to small unsuspecting children. I love them both, so much. I’m a plain and basic witch. in my small back yard. that some friendships grow old. in a garden, year after year. I let the day go, in its pain. into myself the moon’s white light. and the listening nature spirits. to be strong. And wise. in their witch and fairy costumes. here, different time of year. into their empty icecream bucket. their neigbours, were actual witches. Smiles. I do love Hallowe'en, with its excited children and grinning pumpkins. On the West Coast after the holiday, one sees jack-o-lanterns grinning from all manner of unexpected places, alongside the highway, perched on clifftops, lined up on fallen tree-trunks. They make me smile, wherever I see them. Thank you, Magaly and Rosemary, for adding to the fun and general spookiness with your wonderful poems, and selves! Have a wonderful evening, however you may be spending it, my friends. May there be cackles! Be sure to come back and see who we talk to next. Who knows? It might be you! Thank you for taking the time to do this, Sherry. Love your poem, and the phrase "spell the cat" will stay with for a while, since it birthed such giggles. I really like the last stanza of Rosemary's "October 31st", mostly because I believe that most kids are often all right when they are told... and they see that witches are just people who live differently. Oh these were wonderful...thanks for sharing on this wonderful night! LOL, a pretty quiet night at my house. Maybe I will light a candle, to set the mood. Magaly and Rosemary, thanks for joining in. Hope everyone is having a lovely evening, however you wish to spend it. 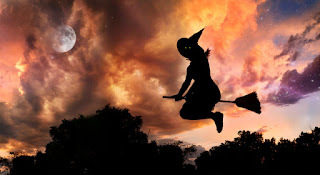 Magaly, I like what you say about witches.........people who live close to the earth's rhythms, not scary at all. Thank you for inviting us to the dance, Sherry. What a treat! Thanks so much for this, ladies. I think I feel a cackle coming on. Smiles. Wonderful Halloween feature, Sherry. And it is a GREAT photo of you, by the way! I enjoyed your light-hearted take. Magaly, what a wonderful remembrance of your brother. I do think that this night of the year we can see through the veil MUCH clearer than at other times of the year. I smiled at one of your poems, Rosemary. I am sure that some would have been shocked had they known they were face to face with REAL witches! I am not sure that I really like what Halloween has turned into here. A friend of mine told me on Saturday that she bought $60 worth of candy, and kids from their neighborhood troop through for about 2 hours time, SO fast and furious that she doesn't have time for a break from all of the candy giving out. That, to me, would not be fun. Who needs ALL that candy anyway!! You'll be pleased to know that the Goddesses of Shining Light, a circle I belong to here, had a special evening for reclaiming the real meaning of Halloween. I gave a talk on its 'ancient roots' in both Samhain and All Hallows Eve. Someone else mentioned Diwalia and Dia de los muertos, as a reminder that the honouring of the dead is a worldwide human need. Yes, this is meant to be very light-hearted, knowing that so many of our members honour other traditions. In America, it has truly become something far more commercial, but fun for the kids, I imagine. Sebastian's costume cost $35, which astounded me. My kids used to make their own costumes and they were very creative. I saw on the news some people are giving out toothbrushes. Smiles. Ah, giving out toothbrushes is a marvelous idea, Sherry. Rosemary, yes indeed, homoring the dead is a worldwide tradition...also, in the Christian tradition today, November 1, is All Saints Day, which also honors the dead. It seems so many of these days occur around this season of the year! Oops, I meant Diwali, of course. I'm right with you, Mary, the way Halloween is viewed and celebrated by the majority is a bit troubling. Still, I rather this than what it used to be... We can only hope for better. Lovely to join in with both of you, Sherry and Magaly. Hope everyone had an enjoyable night! Thank YOU, Rosemary. I love that you had a special evening, and that other traditions were honoured as well. That is really lovely. Thank you for the witchy poems. They made the best halloween! Sherry, Magaly and Rosemary! Tricks and treats! i enjoyed the four featured poems, and Magaly's poem is so touching. That's interesting, dsnake. I wonder why people enjoy being frightened so much. I have my own fright nights every night when I watch the news, especially recently, LOL. I, too, am intrigued by the way people relate (and often seem to enjoy) fear... Very strange... and interesting. I thoroughly enjoyed reading this wonderful selection of poems from our gifted poets. Must agree with Sherry about news bringing us a new fright every night. Always a joy to see you, Jae. Lovely to be perceived as wise and glowing! Thanks. Jae Rose, hope you are feeling better already. I enjoyed all of these poems so special and touching. I am now bewitched in a most wonderful way. 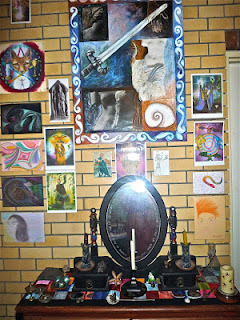 Thank you witchy women for your fascinating words. Magaly, my heart feels for you and the way you honor your brother. Sherry, you chose just the right words to bring a smile. Rosemary I love that you're a real witch and share with us your spirituality. Thank you all. And now November is here, the winter rains have set in, and the winter looms. Warm fires, candles, hot chocolate.........winter joys. Thank you, all, for reading. We have some cool features coming up this month. Stay tuned! Sorry it's taken me so long to visit this very juicy and fun Witchy and Halloween celebration. I do wonder what those little ones would think of real witches! Maybe find them dull next to the fun of creating scarey stories. Hard working job, truly, compared to brewing up a creepy stew. The line that sticks with me today is "sing your scent into my dreams." I've been thinking so much about the losses in my own life, partly because of tomorrow's midweek motif! Got to draw down the moon or the light it reflects from a higher source and put it out into the world as love. I've noticed that the little ones have different reactions. Some do find the whole thing boring and silly and not worth their trouble. Then you run into the very special few, who say things like, "When I grow up, I want to be a Witch. I like knowing things. And I like trees." Those were the words from a seven-year-old who really made me smile. The line you chose, Susan, and the inspiration behind it... is one of the reason I enjoy candles and incense and certain foods so much--they give substance to memories that conjure up people and moments that are now gone... but will always be part of me. The poems were such a joy to read. Thanks for the collection Sherry!! Great Selections for the Halloween season.